Nothing can beat the natural beauty and comfort of wood flooring. The “Readyflor” range of floating timber flooring made from Australian and International timbers, has an extensive range of timber species to choose from in three diffrent styles. Engineered timber flooring has a great advantage of being prefinished with 7 coats of UV­ cured lacquer ready to walk on immediately. This eliminates curing times and the mess and odours from sanding and polishing. Engineered timber flooring is particularly popular in multi storey buildings and with the correct acoustic underlay reduces noise for the comfort of other occupants. “Readyflor” comes with a 4mm solid timber veneer and can be re-sanded and polished in the same manner as conventional flooring. “Readyflor” has a hardwood core which provides that extra stability enabling the product to absorb stresses and strains in almost any conditions. 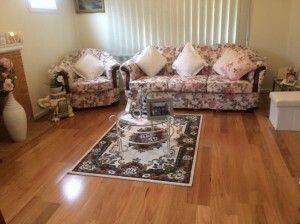 Please have a look at our Floating Timber flooring gallery.